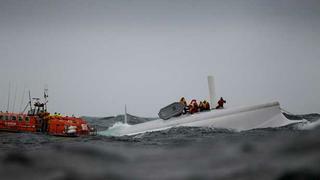 The notoriously treacherous Rolex Fastnet Race ended in dramatic style yesterday for yacht Rambler 100 (USA), which capsized between the Fastnet Rock and the Pantaenius Buoy after her keel snapped off at 17:25 BST. At the time, Rambler 100 was leading the monohull fleet and vying for monohull line honours. Irish Coastguard services, who co-ordinated the rescue, called for all ships in the area to be on standby, and first to respond were the Team Phaedo Media Team, who had braved weather and high seas to be near the Rock for the ultimate picture. They found 16 of the crew who had managed to scale the upturned hull of Rambler 100, but the Atlantic swell had swept five crewmembers out of sight. The Baltimore RNLI lifeboat was quickly on the scene, taking the rescued crew back to Baltimore Harbour. After searching the area from where they had received a personal EBIRB transmission, the missing crew - among them owner George David and his partner Wendy Touton - were spotted and winched aboard a local fishing boat Wave Chieftan, which had been diverted by the Valencian Coastguard. They had spent two and a half hours in the water linked together in a circle. One of two Sikorsky helicopters that were scrambled from Shannon Airport air-lifted Wendy Touton for medical attention due to the effects of hypothermia. An Irish Naval vessel also headed to the area of the accident. The Irish Examiner interviewed owner George David on the morning after his boat capsized. Rambler 100, ex-Speedboat, is a 29.99 metre Cookson super-maxi monohull, which was featured in the September 2008 issue of Boat International. A record-sized Rolex Fastnet Race fleet - 314 starters - set sail from Cowes on Sunday 14 August in classic conditions - a building west-southwesterly and sunshine, but with ominous looking clouds over the mainland. This is the 44th edition of the Royal Ocean Racing Club's biennial flagship event - a non-stop race which takes the fleet 608 miles along the south coast of the UK, across the Celtic Sea to the Fastnet Rock off southwest Ireland, before returning around the Scilly Isles to the finish in Plymouth. For the finishers, the record to beat is 1 day, 20 hours, 18 minutes - set by ICAP Leopard (GBR) in 2007.